Chicken (71%), WHEAT Flour, Vegetable Oil (Rapeseed), Salt, WHEAT Starch, Potato Starch, Fibre (Citric, OAT, Chicory), Spices, Spice Extract, Onion Powder, Garlic Powder, Flavourings, Yeast Extract, CELERY, Dried Glucose Syrup, Dried Yeast, Antioxidant: Rosemary Extract, Acidity Regulator: Sodium carbonate. OVEN: Pre-heat oven to 200°C/390°F/Gas mark 6. 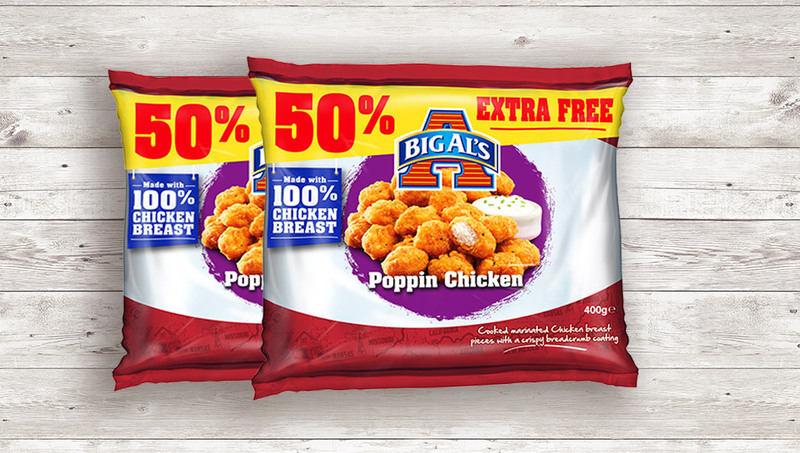 Place the Big Al’s chicken pieces onto a flat baking tray and cook for 12 to 15 minutes, turning occasionally during cooking. DEEP FRY: Preheat oil to 182ºC and fry fillets from frozen for 2.5 to 3 minutes.